Is there a better alternative to Scout File Explorer? Is Scout File Explorer really the best app in File Management category? Will Scout File Explorer work good on macOS 10.13.4? Scout File Explorer is a simplified file manager with a tree-style browsing interface. Two pane tree-style file view. Performs all normal file operations (copy, move, delete, rename). Supports all clipboard commands on files (cut, copy, paste). Drag and drop support (both for itself, to/from your desktop, and to/from other apps). Sort your files by: name, size, type, modified. 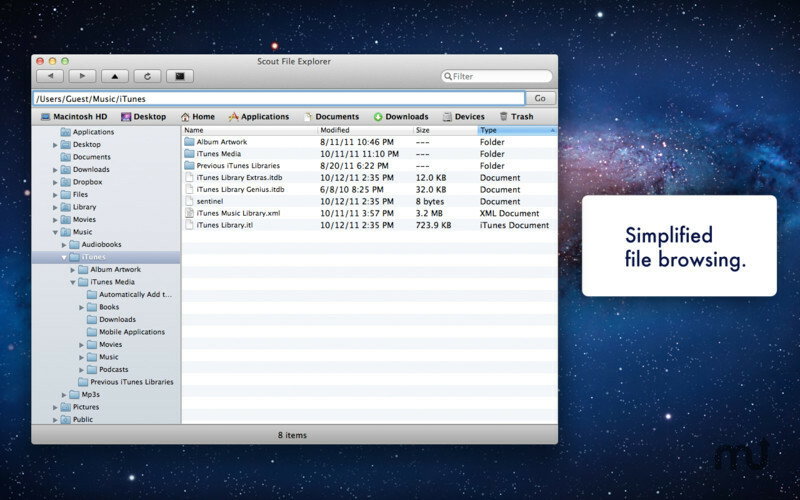 Filter your current directory to find a specific file. Context menu support for file and clipboard operations. Scout File Explorer needs a review. Be the first to review this app and get the discussion started! Scout File Explorer needs a rating. Be the first to rate this app and get the discussion started! Convenient shortcut buttons for your Desktop, Home, Applications, Documents, Downloads, Devices, and Trash. Open Terminal button quickly opens a Terminal window at your current location. Note: file operations require your user account to have proper permissions for the target files and folders.